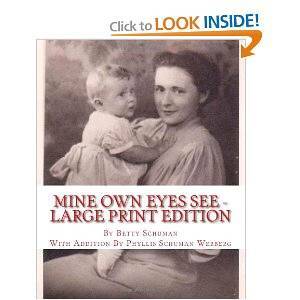 Phyllis Schuman Werberg is the main focal point of the true story of "Mine Own Eyes See." 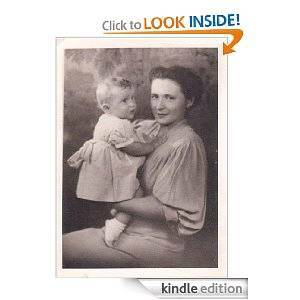 The book, written by her Mother, Betty Schuman is a first person account of Betty and her husband's dilemma of how to best provide an education for their daughter, Phyllis, who was legally blind. The book was finished in the 1950's, but only published in 2011. Phyllis provided an addition to the book, which brings the reader up to date on her life until the year 2008. 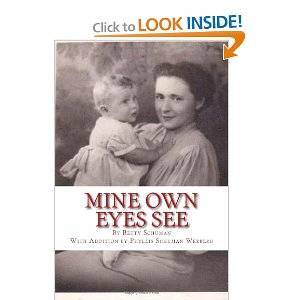 "Mine Own Eyes See" is available in a regular print version, a large print version and a Kindle version on Amazon. Q: One of the things that your Mother, Betty, asks herself, is whether sending you to a residential blind school was the right decision. She actually says, "We may never know." What is your perspective, decades later, on having been educated in a residential school for the blind? My perspective on being educated in a school for the blind is, it was the best thing, since not only was everything in Braille, all the way from math to music, but also, of course, the social life was great, though of course limited to only other visually impaired or totally blind classmates. Q: What advice would you give to a parent of a child who has a vision impairment? I don't know if residential schools even exist today. If they do, I still feel they are good for the reasons given above. Here again, we must remember that vision is not cognition and that a person with a visual impairment can rightly take their place in society and be employed and maintain their home. Q: You accomplished many things, including obtaining two college degrees, travelling by yourself, and raising five children, with no help. Where do you get your drive from? Here again, it's more of a question of attitude, rather than just looking at the situation, i.e., being legally blind, that makes the difference. You do, of course, need to be willing to take advantage of all the helps that are available, but at the same time, you still don't want to be a person totally dependent on others. Q: What have you been up to, since you updated the book? This is the most exciting one of all! In September of 2008, just a couple of months before the addition I wrote ended, my husband and I joined a church called Bible Baptist Church, located at 779 Elmont Road, right here in Elmont, NY. Shortly prior to that time, the church began uploading the pastor's sermons to an amazing website, www.sermonaudio.com/jbarker4. That web address will bring you directly to our web page on the site. When I expressed an interest in getting involved with this, the lady who had been doing it patiently taught me how to upload the sermons, and even here, it would be impossible without this amazing low-vision equipment, ZoomText, on my computer, since though the sermon is of course audio, there is some visual work involved in the process. And the especially exciting thing about sermonaudio is that people can download the sermons in countries where we can't send missionaries. Also, when people request them, I make CDs of sermons which they sometimes even send to people in distant places. And most recently, when the pastor forwards letters from the missionaries, I read them, select prayer requests, and then send the requests to the pastor to then put on the prayer sheet for the mid-week service on Wednesday night.